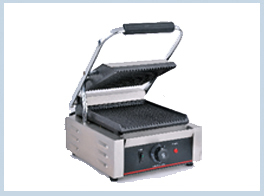 We are engaged in manufacturing and supplying of Sandwich Griller. Offered griller is manufactured using premium quality components and advanced technology in line with industry norms. Widely used in canteens and cafes, provided griller can be availed in variegated specifications and sizes as per the needs of our clients. Furthermore, we offer this griller to our clients at pocket friendly prices.